« Best Anti-Aging Serum 2011! The natural progression of the aging process is due to cellular degeneration. Today it is widely accepted that the loss of collagen in aged skin results not only from the reduced synthesis but also due to its enhanced degradation triggered by free radicals. The repeated free radical exposure induces wrinkling of the skin, sagging of the skin, and DNA damage. Although many different classes of molecules such as UV filters and anti-wrinkle products are available, there are only few products available that protect collagen, the major structural component of skin connective tissue. “Ancients knew about benefits of White Truffle – the Elite of the truffle world. In the early Eastern civilizations, it was not only considered as food, they are also noted for the medicinal value. The legendary white truffle, often literally worth its weight in gold – and sometimes auctioned for much more. Today we were able to explain it from scientific point of view.” – says Nataly Giter, the company’s founder. Researchers have found what White truffle is one of the planet’s richest sources of B vitamins, also known as “the beautifiers”. Vitamin B complex provides oxygenation to the skin, improves blood circulation and toxin removal, controls cell formation and cell life span. B-5 is responsible for reducing stress yielding a smooth and lustrous skin. It also plays a key role in skin hydration, moisture retention and, where needed, hinders the process of acne formation. Truffle Extracts are excellent source of Superoxide Dismutase or SOD. The SOD is one of the most powerful cellular antioxidants. SOD is naturally occurs in our body, but it declines dramatically as we age. SOD enzymes provide exceptional cellular protection against free radicals while offering anti-inflammatory properties and ultimately slow the aging process. Launched in 2009 by Nataly Giter, a hands on skin care professional for two decades. Through research and practical experience, she learned about the ingredients that work best and became associated with Dr. Chiu, a professor from Ohio University. Dr. Chiu is the first global pioneer to clone the human FGF 1 gene. Together with Dr. Chiu and their combined connections to industry professionals, they utilized FGF 1 to create an extraordinary anti-aging product line, using 99 percent pure FGF 1 peptide – the best quality available outside of human body. 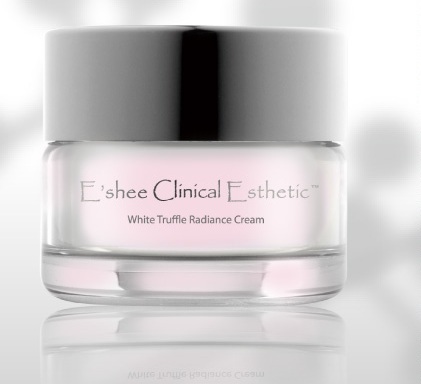 3 comments to E’shee Clinical Esthetic Launches new extraordinary anti-oxidant – the White Truffle Radiance Cream. Hey there administrator, I just wanted to firmly give a swift statement to firmly admit that I preferred your specific piece of writing. Thanks!